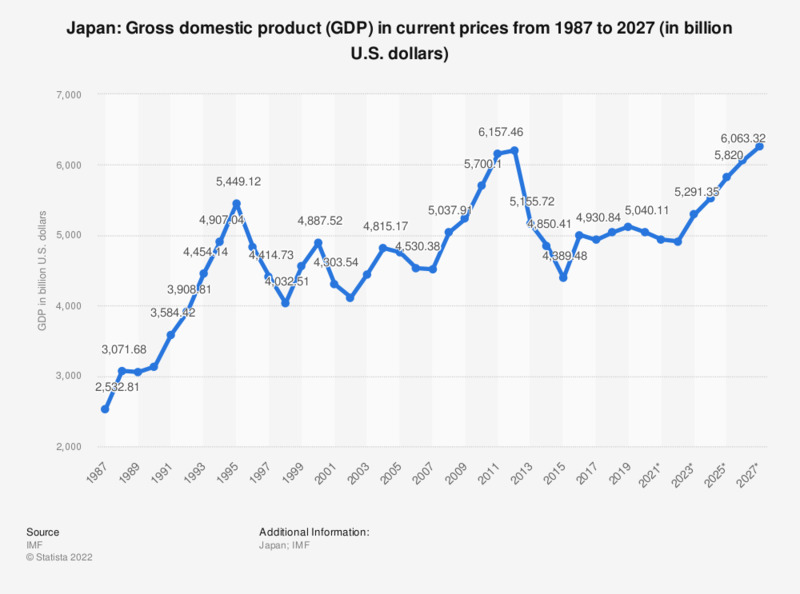 The statistic shows the gross domestic product (GDP) in Japan from 2012 to 2017, with projections up until 2022. In 2017, the gross domestic product of Japan amounted to around 4.87 trillion U.S. dollars. This makes Japan third in the world GDP ranking. For comparison, the GDP of China had amounted to 8.39 trillion U.S. dollars in 2012, marking the second-largest economy in the world. Japan has one of the highest gross domestic products (GDP) per capita, one of the lowest inflation rates, and ranks among the top three countries in terms of the largest overall GDP. This economic powerhouse has managed to maintain control of its inflation rate, keeping it below three percent since at least 2004. Despite the worldwide recession in 2008 and 2009 and a dip in the growth rate of the GDP, Japan managed to maintain positive growth in the GDP itself. Japan is disadvantaged, however, when it comes to natural resources. A large amount of the landmass of Japan is human-occupied, leaving little in terms of husbandry or agriculture. It has become a highly urbanized country and employs very little of its workforce in agriculture, choosing instead to focus on its services sector. The population of Japan is aging, providing a rocky economic forecast for years ahead. As the baby boomer generation starts to retire, they will leave more job openings than there will be workers to fill them. The government will have to work to provide retirement pensions for a growing amount of people, although if current trends persevere, there will be fewer people left paying taxes to fund the pensions.